In order to streamline our work order service requests and improve customer service the Building Maintenance and Parks & Grounds Department has established a new policy for submitting work order requests. 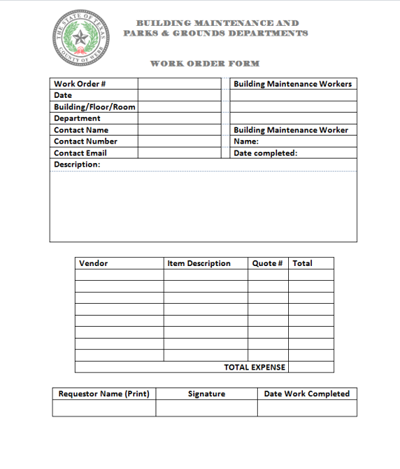 fbm-workorder@webbcountytx.gov using the form below. Available on the (T:) Drive, Building Maintenance & Parks & Grounds, Forms, Master Work Order Form. Please be as detailed as possible with your request.